It's unquestionably the most romantic time of the year. Whether you and your sweetie have been together for decades or are still feeling that first rush of chemistry, there's no better place to spend Valentine's Day than in the Great Smoky Mountains. With stunning views that leave you breathless, quiet restaurants perfect for a candlelit dinner for two, and plenty of activities to choose from, you'll discover a truly special experience the two of you will love. When your days are filled with work and traffic and endless interruptions, it's hard to take time out just to appreciate one another's company. Sometimes you feel as if weeks have passed without a quiet conversation, a cuddle on the couch, or even a meaningful moment together. 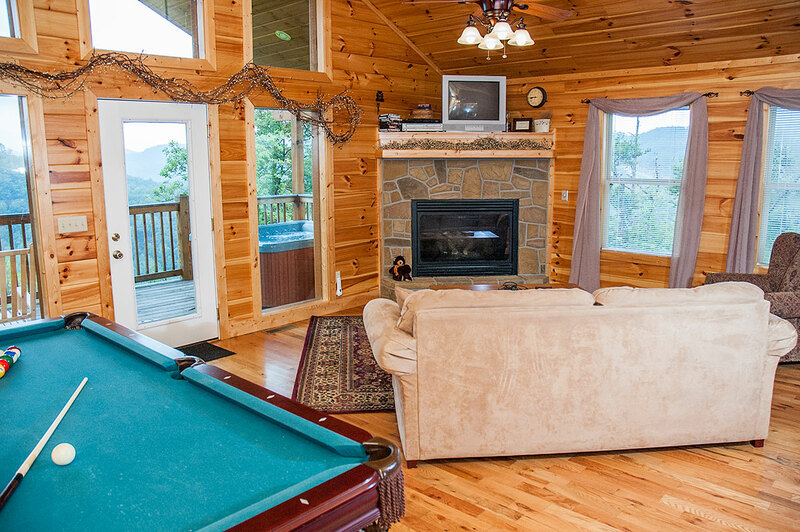 Valentine's is the perfect time to bring some intimacy back to your relationship, and there's no better place than a private cabin rental in Gatlinburg, TN. Imagine waking up to the unforgettable sight of the sun rising over snow-covered mountain peaks. Enjoy a steaming cup of coffee on your porch while you watch the forest awaken for another day, and relish the tranquility only a mountain hideaway can offer. After breakfast, there's plenty to see and do in town, but don't miss the opportunity for some truly relaxing down time together. Consider a quiet soak in the hot tub, an in-room couple's massage, or simply stay in and watch a movie. It's your weekend, so make the most of it. A gourmet meal, the golden light of a candle, and soft music plays in the background...Is there any better way to celebrate Valentine's Day? Or maybe you prefer a little entertainment with your meal. After all, being able to laugh together is one of the keys to a long and happy relationship. In Gatlinburg and Pigeon Forge, you have your choice of dozens of restaurants, from intimate bistros to boisterous dinner theaters. Enjoy a few belly laughs with your love as the Hatfields and McCoys battle it out, or gaze lovingly into his eyes over a candlelit dinner. No matter your preference, it's sure to be an evening to remember. Of course, you could always stay home and whip up your own meal in your cabin's fully equipped kitchen. Enjoy the closeness that comes from cooking together, while a fire crackles on the hearth and dusk settles over the mountains. In addition to those romantic evenings alone, couples will want to take some time out to see the sights as well. History lovers shouldn't miss a chance to visit Titanic Pigeon Forge, where you can tour a stunning replica of one of the most famous ships ever to set sail. Sports enthusiasts can hit the slopes at the South's premier ski resort, Ober Gatlinburg. Getting there really is half the fun, so even if you don't ski, it's worth a trip to the top on the aerial tramway. Finally, remember to just take in the sights. The Great Smoky Mountains National Park offers some of the finest hiking trails anywhere, and the views from some of the trails are not to be missed. Don't let this Valentine's Day slip away without experiencing the romance and passion of the Smokies. Whether you want to hide away together in a secluded cabin in the woods, or prefer to spend your days taking in the sights, there's just something about the Great Smoky Mountains that makes it the perfect destination for your next romantic getaway.